There is no question that having a mentor and/or becoming a mentor benefits everyone involved: the mentee, the mentor and the company. In this post, we will review some of the benefits on both sides, as well as some key performance indicators (KPIs) that will help you to evaluate the strength of your mentoring program. Ask any successful person how they got where they are today and it’s very likely that one of the key factors they will mention is having had a great mentor. What is it about these kinds of professional relationships that makes them so valuable? It enables you to get back to your own career path. Let’s face it – we all get caught up in the day-to-day of our jobs and it’s easy to let the time pass by without revisiting our career goals, especially as we gain more tenure and get “comfortable” in our roles. By mentoring others, you have the opportunity to consider your own career journey with fresh eyes. You get to pull out and utilize those skills that you might not get to use everyday. Because being a mentor requires different skills than being a manager – thinking beyond the roles and the workload to address personal career goals – you get to share and personalize experiences that you might not ordinarily. And this can be incredibly rewarding. You can foster relationships that transcend generation gaps. There’s a lot of talk out there about Millennials entering the workforce in droves which presents some incredible opportunities both for companies and for employees to learn from each other. While more seasoned employees have experienced “climbing the corporate ladder,” younger employees often have an entrepreneurial spirit that drives new ways of thinking and innovation. Clearly, there is something to be gained on both sides. Let’s shift gears now and focus on the other side of the equation: the mentee. Why Should You Seek and Engage with a Mentor? Access to an incredible wealth of experience. Oftentimes, these experiences aren’t necessarily things that can be learned in a classroom. An inspirational and aspirational example. So, we all recognize how beneficial it is to work with a mentor but how do you actually go about finding one and then approaching that person about mentorship? Think of yourself not only in the present but in the future tense. As you look out 5-10 years, what do you aspire to be doing? When you think about where you want to be, who are the professionals that you may be aware of who are in those roles and career stages? Chances are, you may already know a few people who might fit the bill or you may be able to locate these leaders through your existing network. First things first: spend time to learn about these potential mentors. Attend events that they might be speaking at, read their blog posts and papers, and learn about their work. Reach out and introduce yourself to begin the process of building a relationship. While you may want to jump right in and ask the person to be your mentor, it’s not a good idea to ask someone who is virtually a stranger to take on this role. Keep in mind that a mentor/mentee relationship is a two-way street. In order for the relationship to work, both parties must get something out of it. This being the case, you can understand why most leaders would shy away from agreeing to mentor someone without understanding what they might contribute to the relationship. So spend some time and figure out what you can bring to the table. For example, maybe you’re a wiz at social media and your potential mentor hasn’t really had time to engage on social networks. You can offer up your expertise, help him/her set up their accounts and then serve as their mentor in this particular area. This concept is also known as “reverse mentoring” – essentially, you are both mentoring each other! In light of this, it’s important to take some time to think about the skills and value that you can bring to the relationship and don’t be shy about offering it up as you engage with these professionals. How Can You Measure and Assess the Value of Your Mentoring Program? Clearly, there is much to be gained on both sides of the mentoring equation – both the mentor and mentee can assist each other in accomplishing key career goals. Mentoring programs can really pick up steam when you publicize the wins that your organization is experiencing so make sure that you spread the word! We have seen firsthand that the best mentor/mentee relationships are the ones in which there is ongoing back and forth communication that includes an honest exchange of ideas, thoughts and feelings. And oftentimes, they become lifelong friends who keep in touch as they move on to new positions, companies and stages of life. 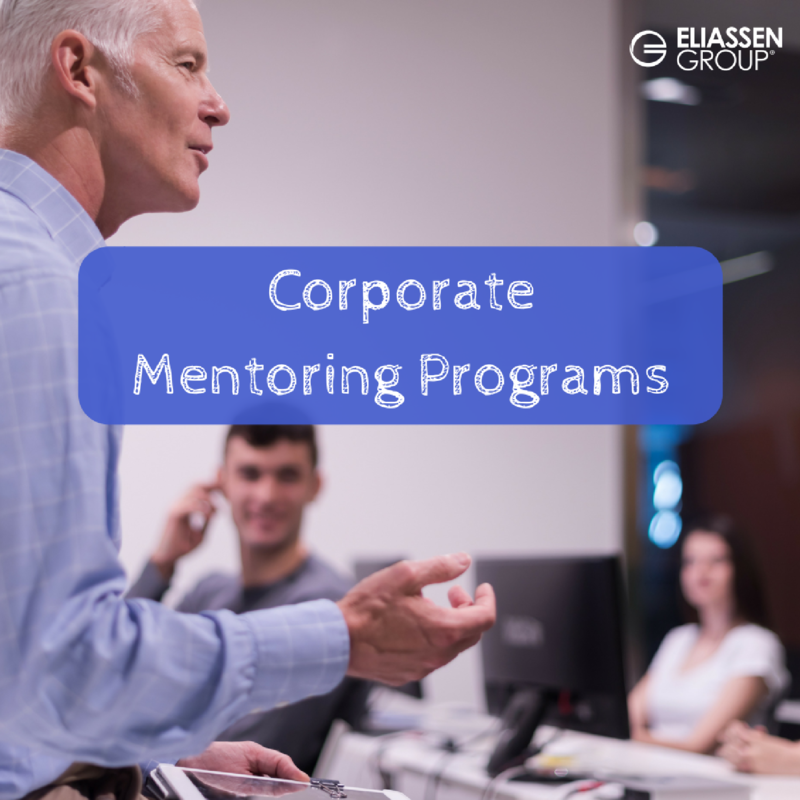 Do you have a corporate mentoring program in place? How's it going? We'd love to hear examples of programs that are working well, as well as any lessons learned. Share them with us on Twitter, LinkedIn and/or Facebook!